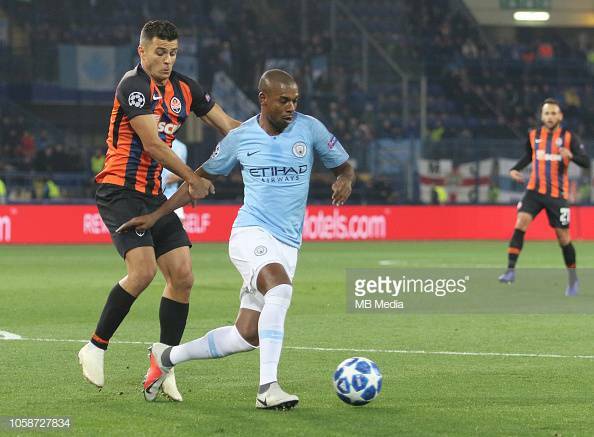 Manchester City vs Shakhtar Donetsk Preview: Can returning Brazilians take revenge for home defeat? Manchester City welcome Shakhtar Donetsk for the fourth match in the Champions League group stage on Wednesday. Here's everything you need to know about the fixture. Manchester City were extremely dominant in the away trip to Shakhtar Donetsk. They had 53% of the ball and took 24 shots to Shakhtar's 14. The victory along with Lyon's draw with Hoffenheim took City to the top of the group with six points and with Lyon hosting Hoffenheim this week, City will look to take a stranglehold of top place in the group with 9 more points. Shakhtar manager Paulo Fonseca welcome back Taison and Dentinho, both of whom missed the reverse fixture at the Metalist Stadium in Kharkiv. Both of them are extremely important to the way that Shakhtar play and their absence has been keenly felt. Fonseca has said that even though he realizes that his team are not favourites, he has confidence in them. Having kept Riyad Mahrez, Danilo and Gabriel Jesus all on the bench this weekend, Pep Guardiola will be keen to rotate his side to keep them fresh for the weekend's Manchester Derby. John Stones has been the only constant in all three of their previous matches and was taken off for Vincent Kompany on Sunday against Southampton after City had put the match to bed, so he might again get the opportunity to take a breather. Phil Foden and Brahim Diaz, who impressed against Fulham in City's previous midweek exertions, may also feature, but only if City can establish a lead early in the match. After missing the last seven matches with a hamstring strain Ilkay Gundogan could feature from the bench as he posted that he could be on the pitch soon on social media. In other news, Kevin De Bruyne will be kept out for another month at the very least after another knee ligament injury suffered against Fulham in only his third appearance back from a long term injury. Nicolas Otamendi is absent too with a muscular injury.